Here’s my April project. 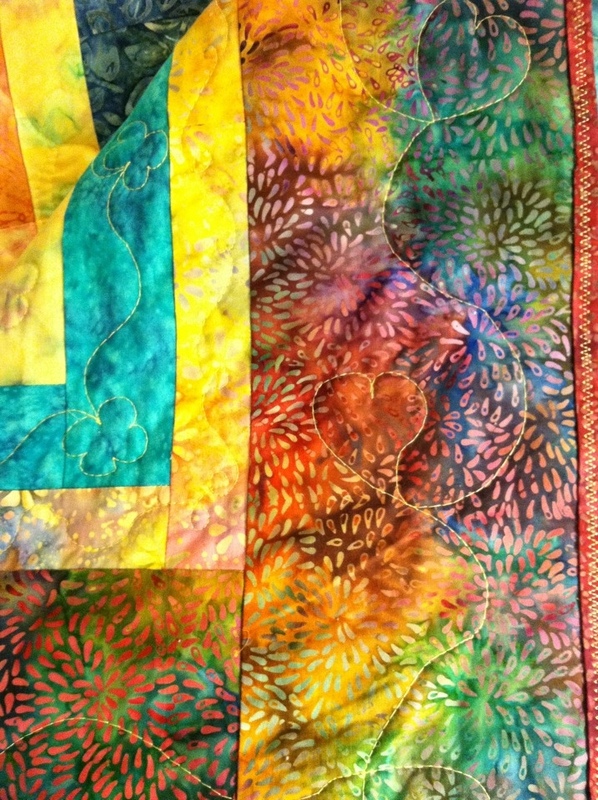 It’s a quilt, done in batiks (and batik imposters). 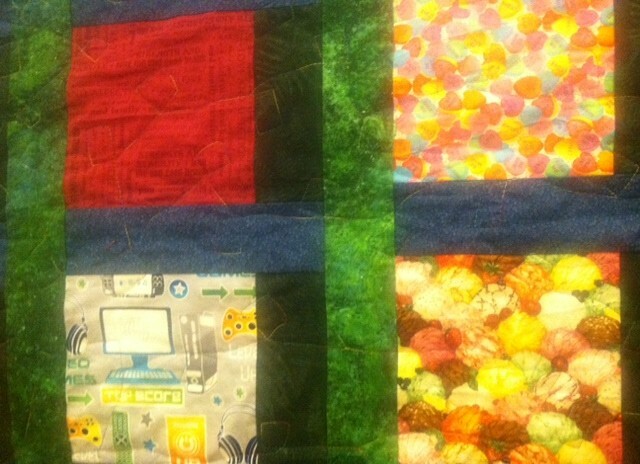 One of my coworkers saw a pile of the fabric on my desk and asked if she could have the quilt when it was done. I said yes, and the rest is history. 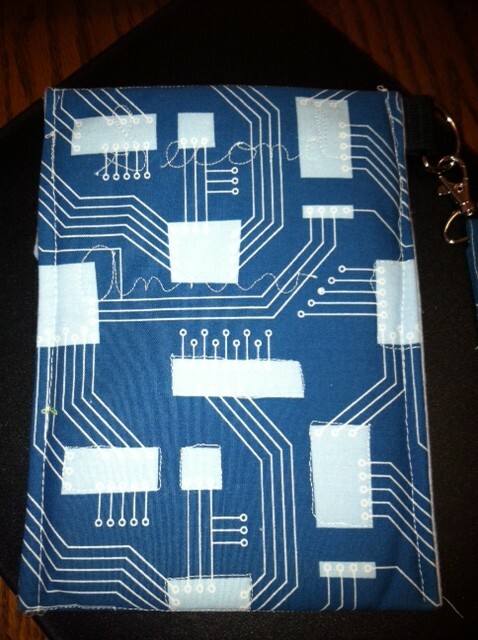 The back is far from perfect, but C was thrilled anyway. 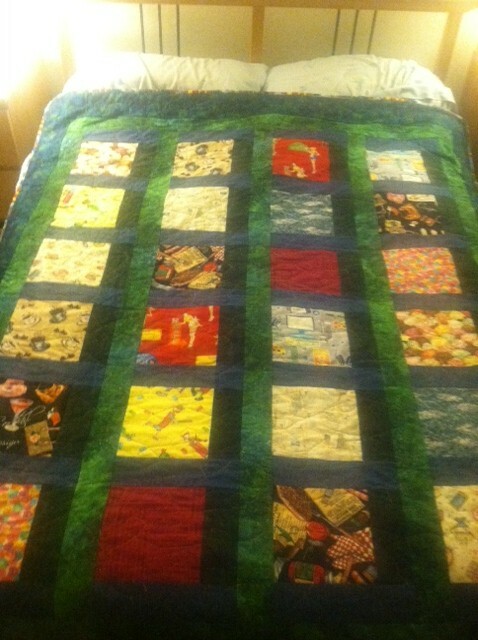 She said that nobody had made a quilt for her before – not even her mom who has made quilts for other family members. 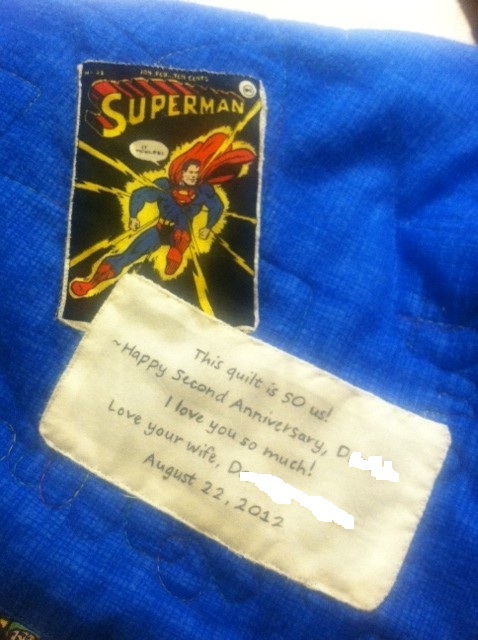 So, I hope you enjoy your quilt, C! 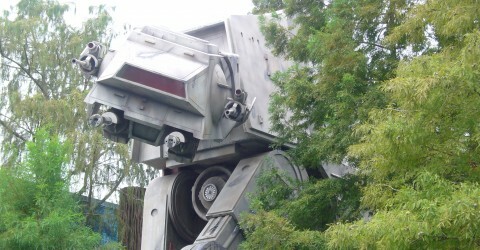 This is the front. Pretty colors! It’s on a full sized bed so it’s pretty big. 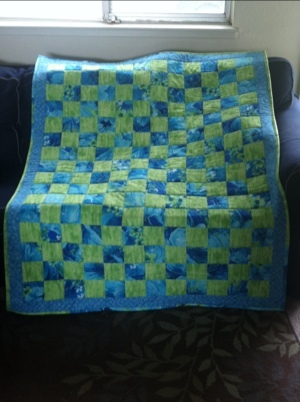 It’s supposed to be a twin sized quilt. 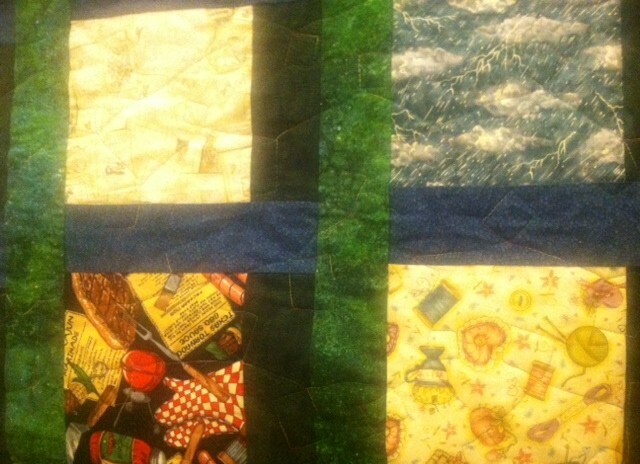 A closeup of the borders and quilting. 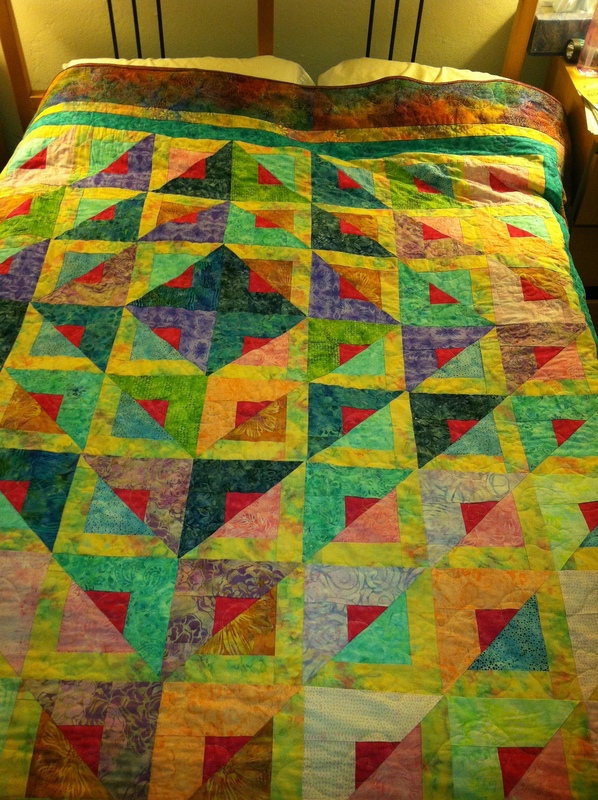 The bulk of the quilt was done in a hearts and flowers pattern. 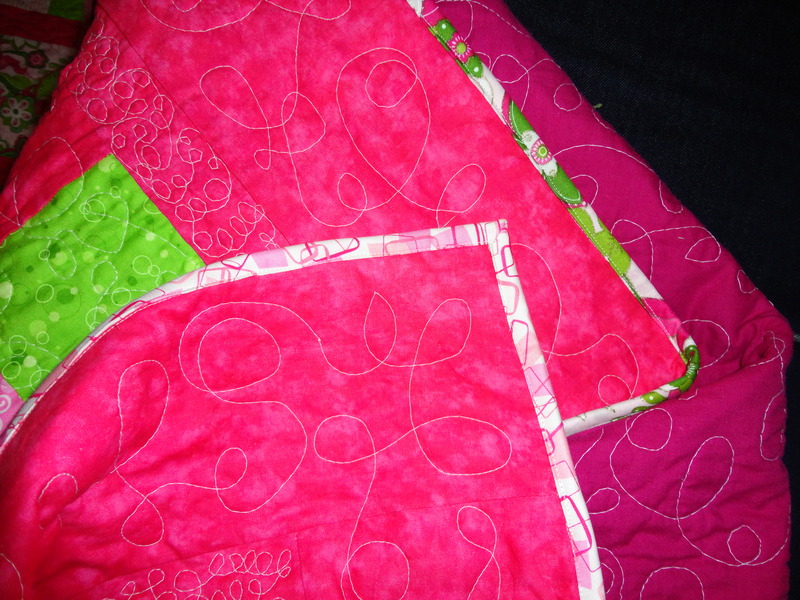 The borders alternates between hearts, flowers and curlicues. 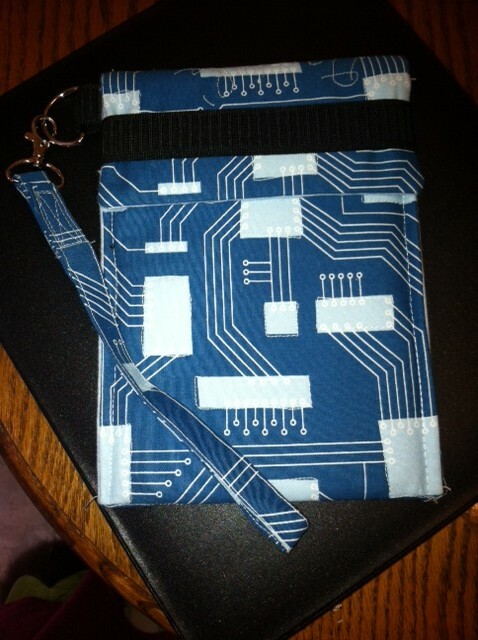 The back. 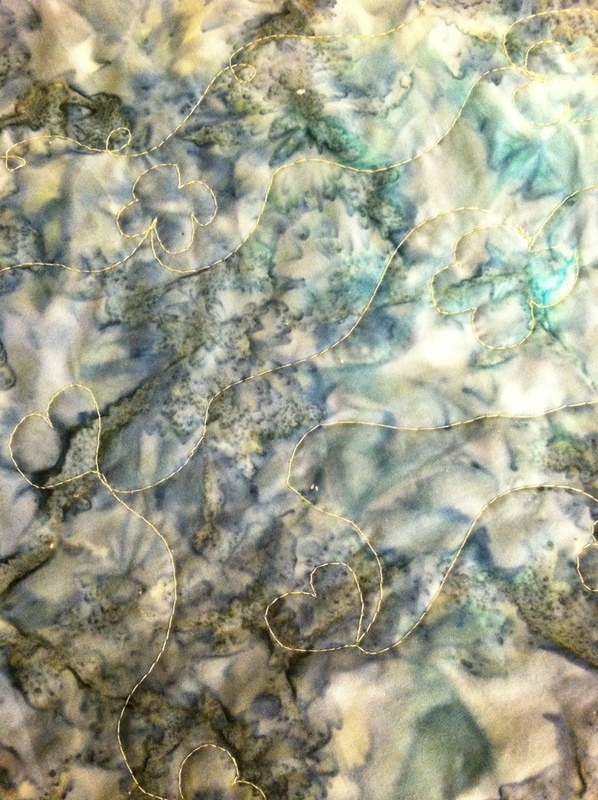 This fabric was originally going to be living room curtains. I think it works better as a backing. 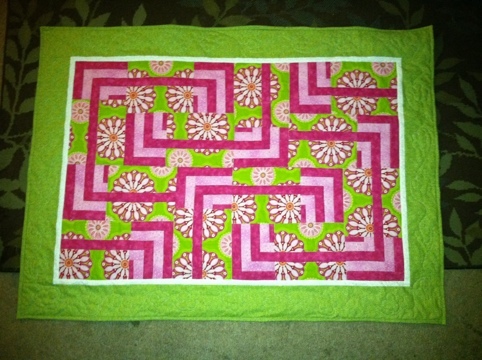 As some of you may know, one of my goals for 2012 is to finish a quilting or sewing project each month. I had a few different options for projects, but I decided to finish one that I started in November. 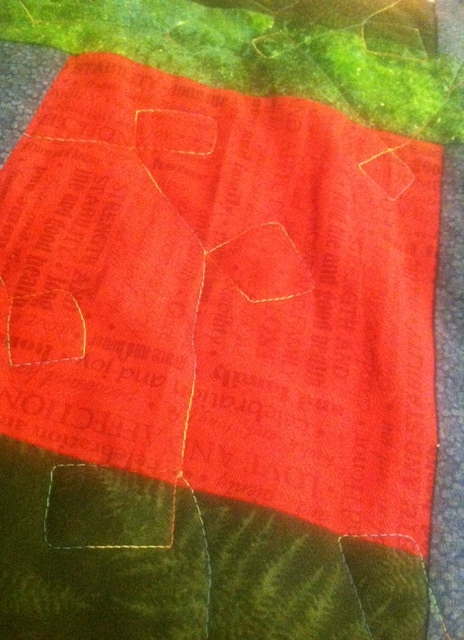 I had most of the fabric (including the backing!) in my stash at that time. 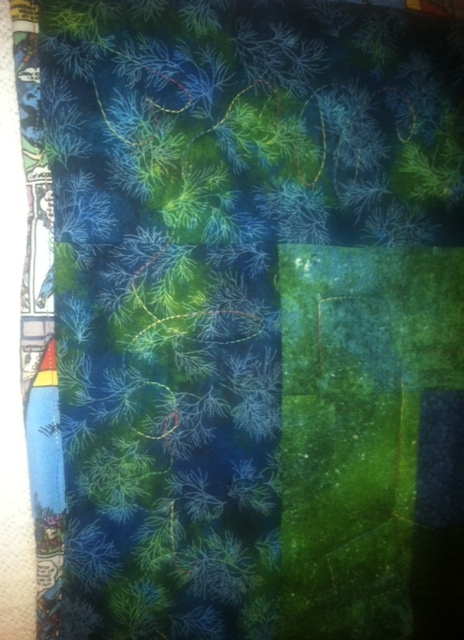 There were a few yards purchased in the November Shop Hop so that I would have enough to complete the quilt. 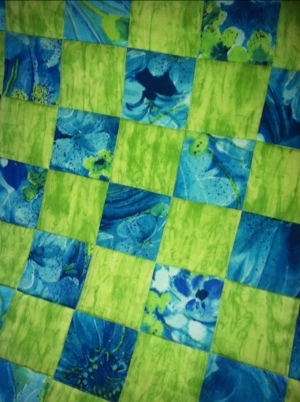 I quickly pieced the top in those bright inks and greens I currently love so much. 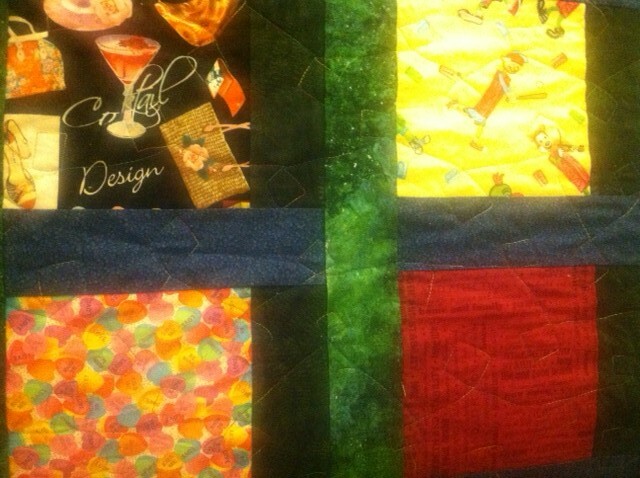 I sandwiched the top, batting and back together and got to quilting. 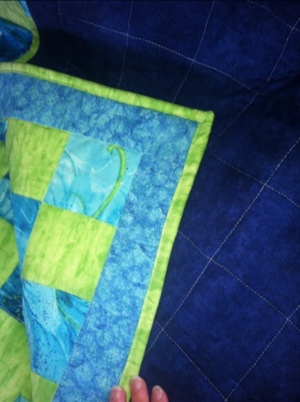 I got the whole thing quilted and THEN turned it over to survey the back… and was horrified. Soooo many mistakes. 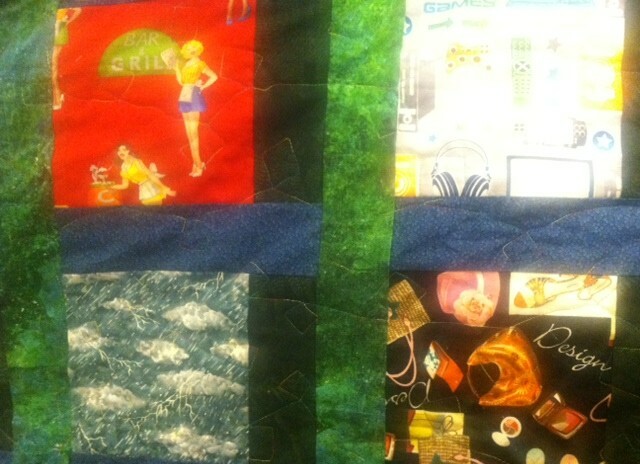 Mistakes I would have caught had I checked the back WHILE I was quilting. 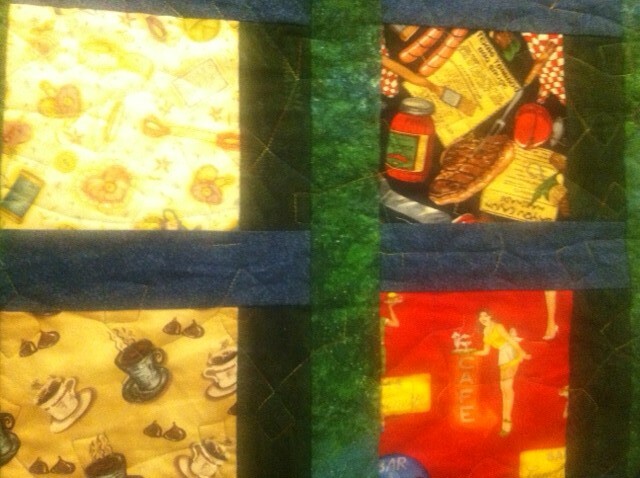 I decided to leave the bulk of the terrible quilting and pull out the most offensive portions. 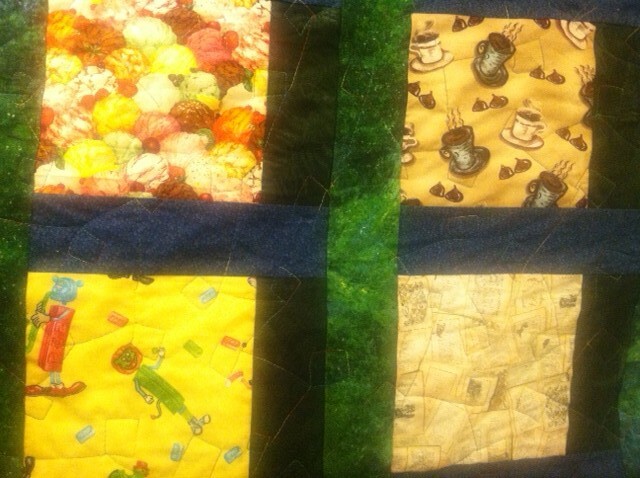 It took 3 days to pull out the quilting in the border (the worst spot). And then I was so disgusted I didn’t want to look at the stupid thing. So it sat on the sofa, reminding me of my mistake. 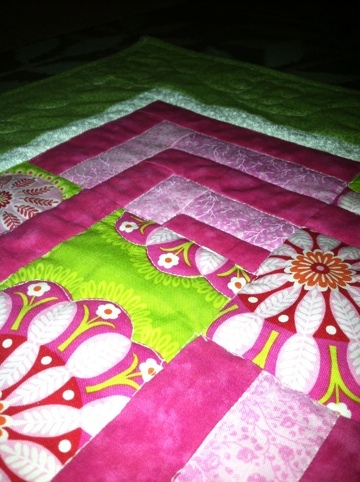 By the time I finally got the gumption to re-quilt the border I’d fallen while jogging and everything hurt. 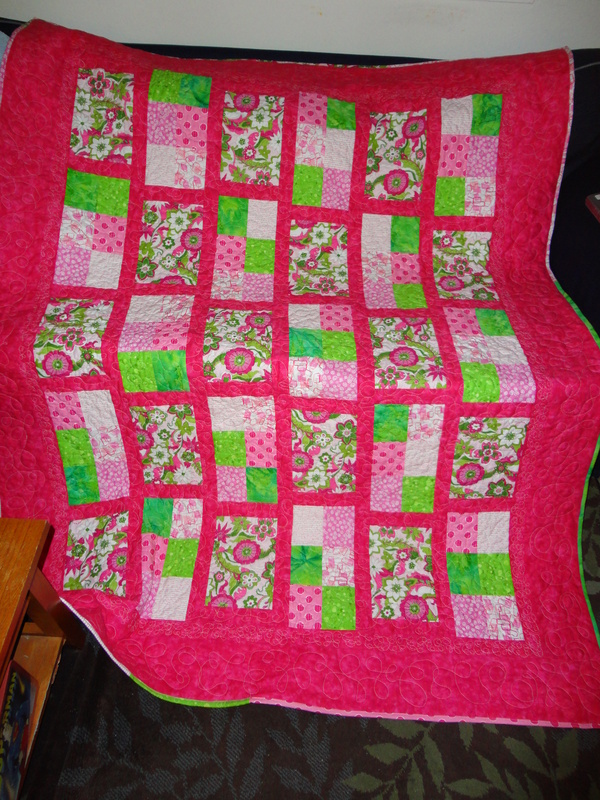 The blanket sat there some more until I decided to finish it for my January project.